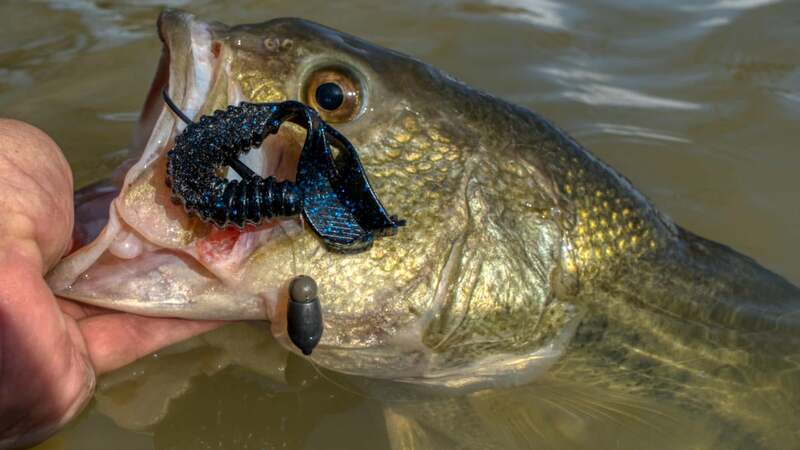 An impressive finish on super smooth tungsten bullet weights and other small features make these awesome weights for bass fishing. I got a bunch of the new WOO! Tungsten Never Chip series bullet weights in the mail this winter and am finally getting to fish plastics a bit on the lake thanks to some flooded conditions and warming water temperatures. 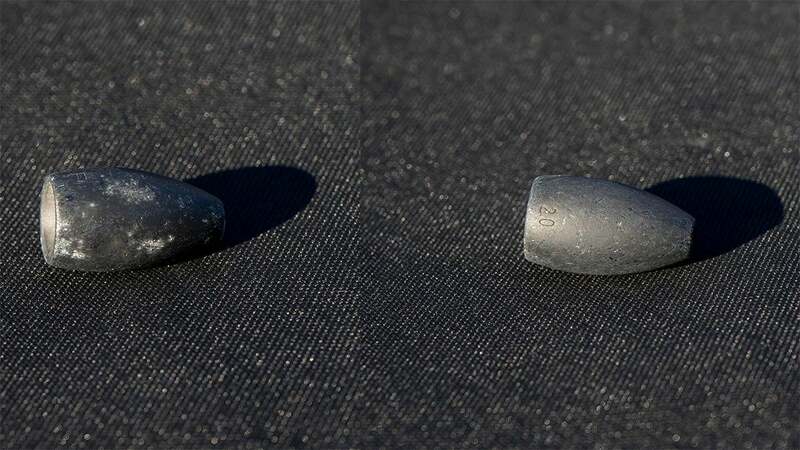 These new tungsten weights have some cool features that I think will have guys buying them this spring. 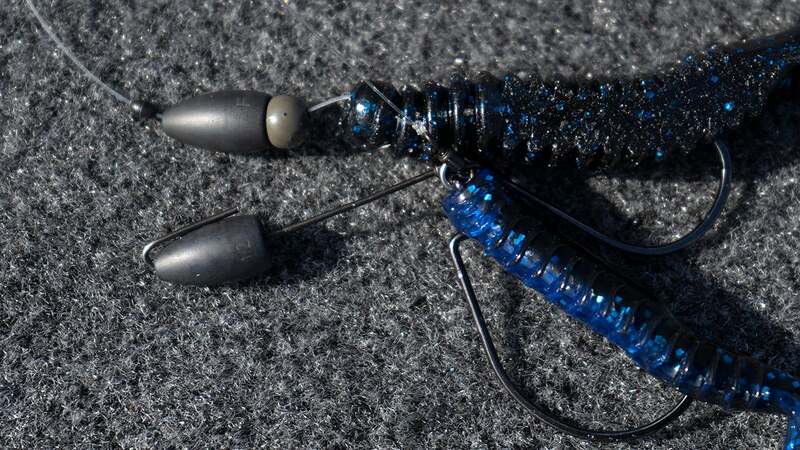 So a couple things most anglers don't like about colored tungsten weights is that the powder coat eventually starts to chip, rough edges can cut your line and forgetting what size weight is which in a tackle box or even on your line if you have multiple rigs with different weights on them. WOO! 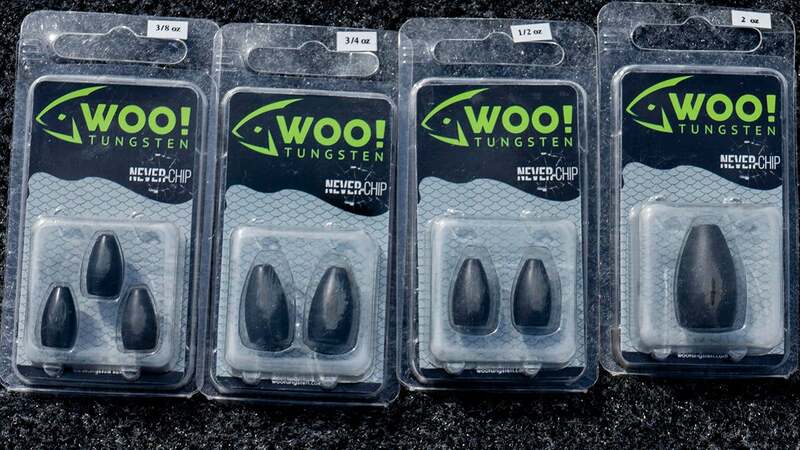 Tungsten appears to have answered all of them in their new Never Chip Flipping Weights. They created a patented process that puts the color in the weight so it's not painted on and powder coated like other weights. It is smooth throughout so no sharp edges and they even went as far as to stamp the weight size on the side of the weight. I've fished multiple trips with the same weight, and it looks just like it did when I got it out of the package. Dragging it on rocks, punching it into heavy cover, banging it around on dock legs and concrete foundations, and it stays looking new. 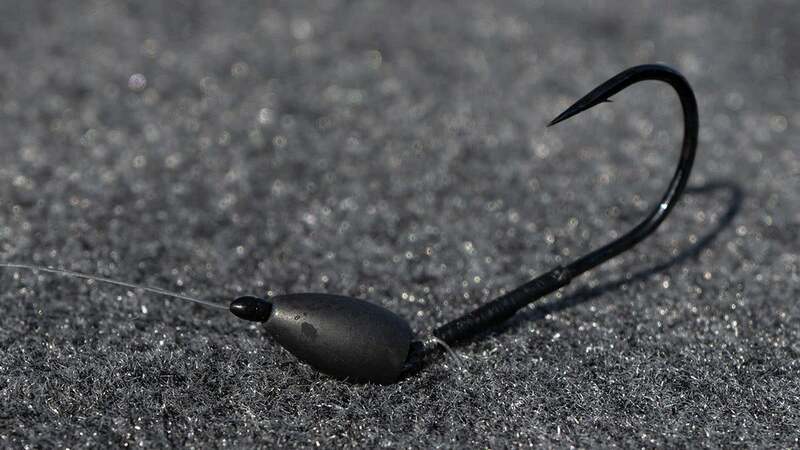 I've fished it on traditional flipping plastics and with beads and even on newer rigs like the Tokyo Rig. I've had no issues with line fraying, rough edges or anything of the sort. So I really wanted to see if it truly would never chip. So I tied one of the WOO! 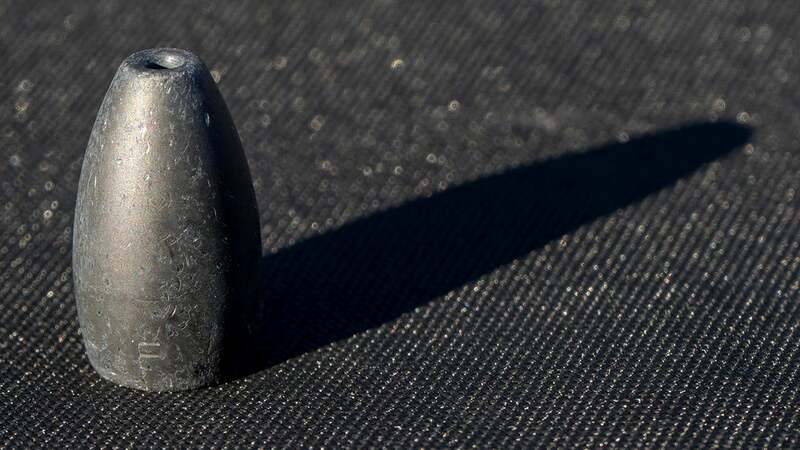 Tungsten Never Chip Flipping Weights on the end of a line and took and swung it down on concrete slab about 30-40 times—hard as I could —chipping the concrete as I did. It put marks on the finish of the matte black weight. But then I simply took my fingers and rubbed the marks off. No chips. No sharp rough edges. The weight on the right is the same weight as the one on the left. I just wiped the concrete marks off with my hand. You can see there are marks in the weight, but it's not compromised at all. I rubbed my fingers and even a Kleenex around the weight to check for something that would grab or have a sharp edge. No blemishes to the touch at all. I assure you that is more abuse than it will ever take in your fishing. WOO! 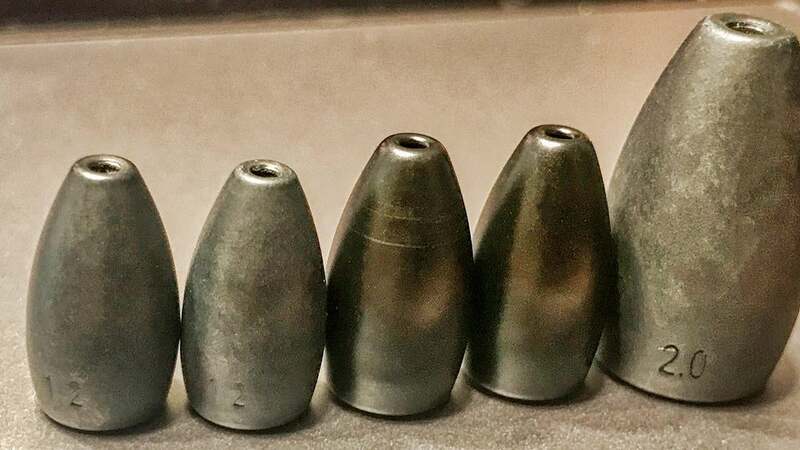 Tungsten has two lines of tungsten weights now. The new Never Chip Flipping Weights is in the grey backed packaging. Says NEVER CHIP on it. It comes in sizes from 1/16 ounce to 2 ounce, all stamped with the size on the weight. Both ends of the weight are smooth. No rough corners anywhere on the weight, alleviating the need for a sleeve. I've been very happy with the WOO! Tungsten Never Chip Flipping weights. I've used the 3/8 and 1/2 ounce sizes a bunch now and love being able to just look quickly at a weight and know if it's the size I want or not. You can find WOO! 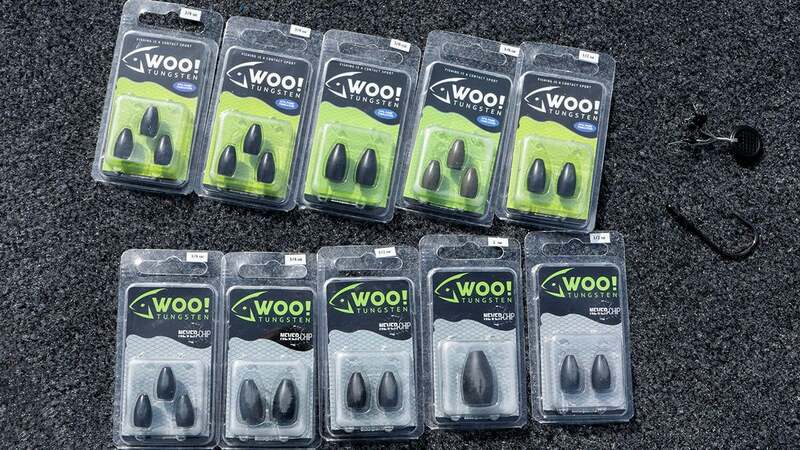 Tungsten Never Chip weights now at TackleWarehouse.com and local retailers carrying WOO! Tungsten products. The Never Chip process, coloring and stamping add a little to the cost per package, but a lot of guys will appreciate the convenience it adds.